The goal of this post it to get familiar with the SimplyTapp toolset that allows you to build, deploy and test a javacard applet in a remote Secure Element architecture. The tools used in this post closely mirror tools created by SIM card makers such as G&D and Gemalto. So we hope you won't find them too different or cumbersome to work with. If so, I hope this post will help the learning curve and you will be on your way with payment card applet development. So, let's download and install the Issuer SDK. select the directory "CardApplet-PayPass" from within the "IssuerSdkBundle" directory. This project contains the PayPass javacard applet that will run on a Secure Element. Feel free to modify this code to see changes during testing. 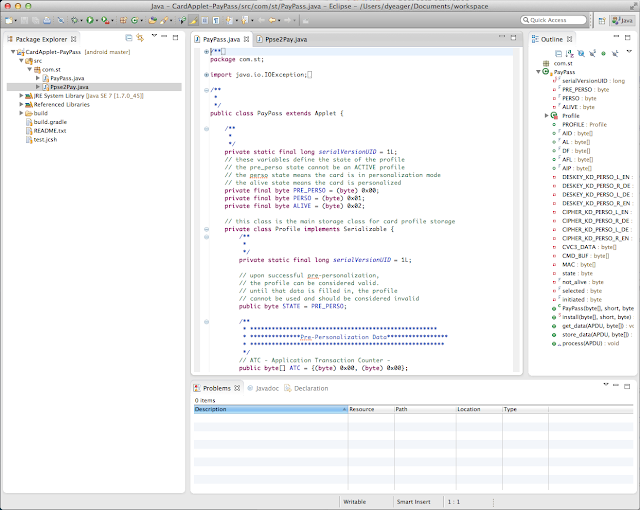 answer the next dialog "Java Application"
let's go through these commands to give a sense of what when on here. FYI, the wiki has begun a short tutorial on gpjNG. Next, we want to authenticate to the security domain. The simplytapp virtual card does not need the concept of "installing for load" as defined in global platform because the load file is already present in the virtual card through the .jar file in the simulator and then later in the same .jar file when it is uploaded to the cloud. The authenticate command uses the default security domain commands of the virtual card to authenticate to it. After successful authentication to the security domain we are able to run GP "install for install" commands in order to install instantiation(s) of the applet into the virtual card. 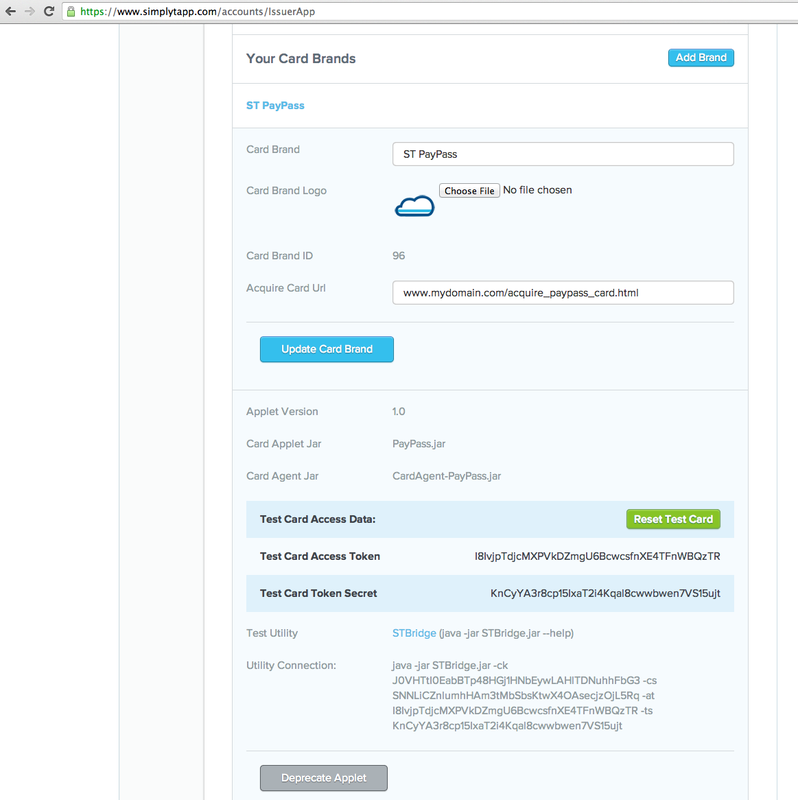 Our test applet .jar in this example has two classes that extend Applet class: Ppse2Pay and PayPass. Each of these applet's can be instantiated into the virtual through the GP "install for install" command. if each of these commands responds with the last two byes (status word) of 90 00, then all went well for installing the applet. And finally, as the applet instance has not been personalized yet, a single personalization command can be issued to the applet. Expand the Java folder in the dialog box and select "JAR file", then click "Next >"
Select a name and destination to put the jar and click "Finish". 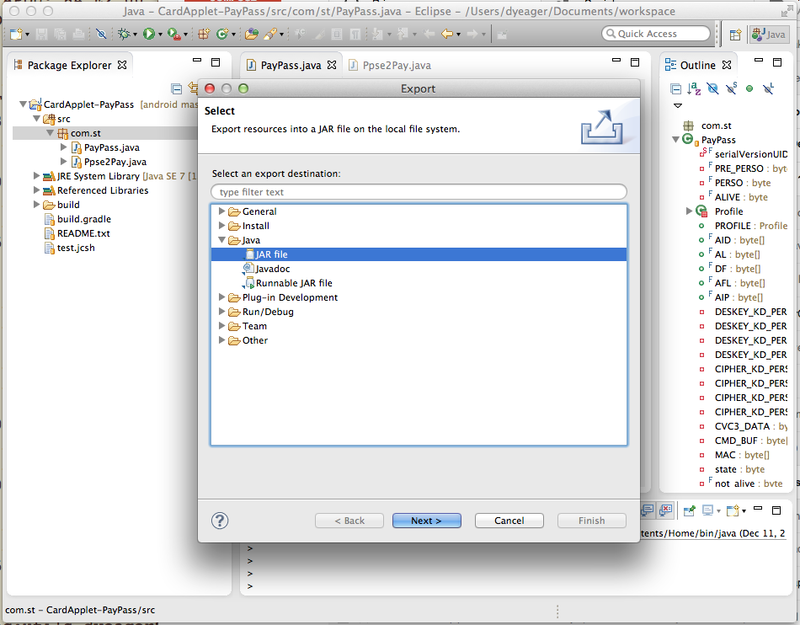 In this example i selected PayPass.jar as the name and opted to export it to my desktop. 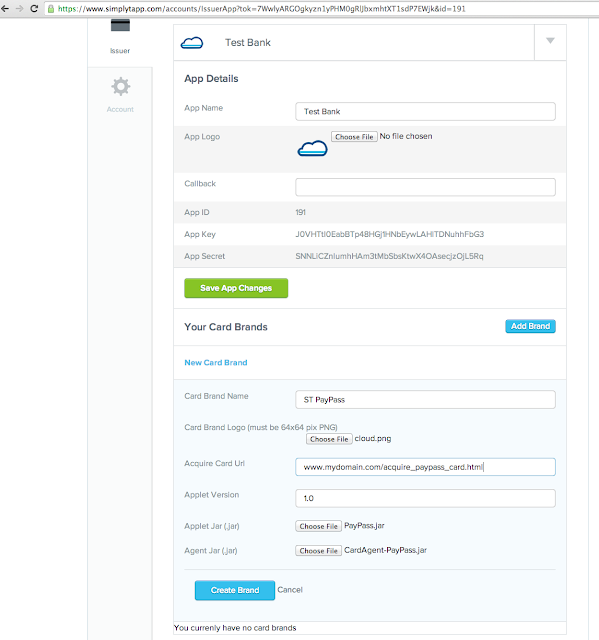 Because this demo does not discuss building and testing a card agent and the card agent .jar file is also required to upload with the card applet .jar file, let's just use the available card agent from GIThub for the paypass applet. it can be found here: CardAgent.jar . please download this to your desktop. 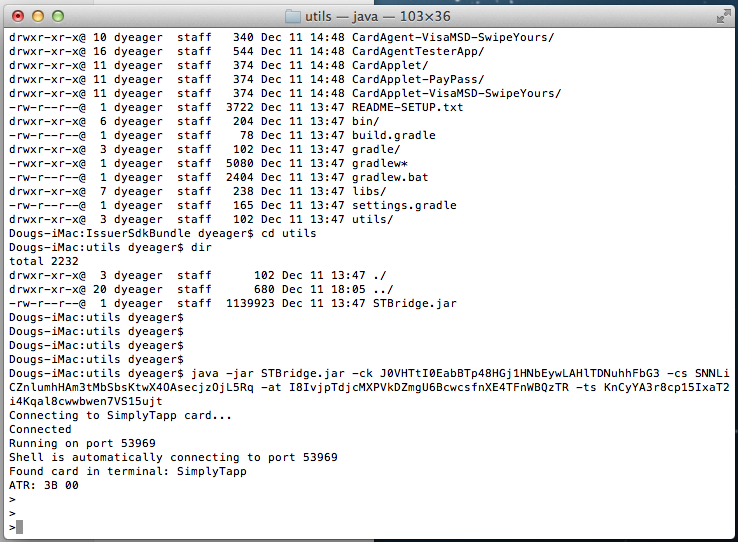 Now that we have both the PayPass.jar (card applet) and CardAgent.jar (card agent). We can load the card applet into the cloud. 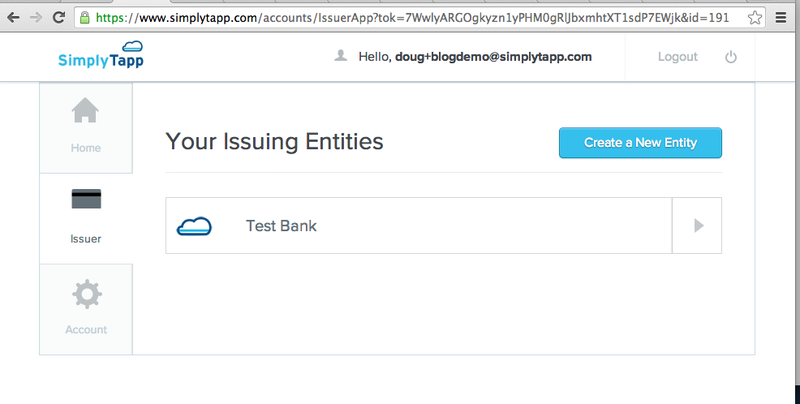 If you do not have a simplytapp account, you will have to click the "sign up" link on this page first. For this example select a name for your new Issuing Entity and a logo I used the name "Test Bank". Feel free to use the generic cloud logo here: cloud.png, just download it to your desktop as well. Select an acquire card URL based on where the registration wizard would begin for this card brand. Just make something up as we will not use this for anything in this demo. Then upload both the Applet Jar (PayPass.jar) and the Agent Jar (CardAgent-PayPass.jar) with the "Choose File" buttons. Then click the "Create Brand" button. On the resulting page, expand the "ST PayPass card brand, and click "Get Test Card" button. 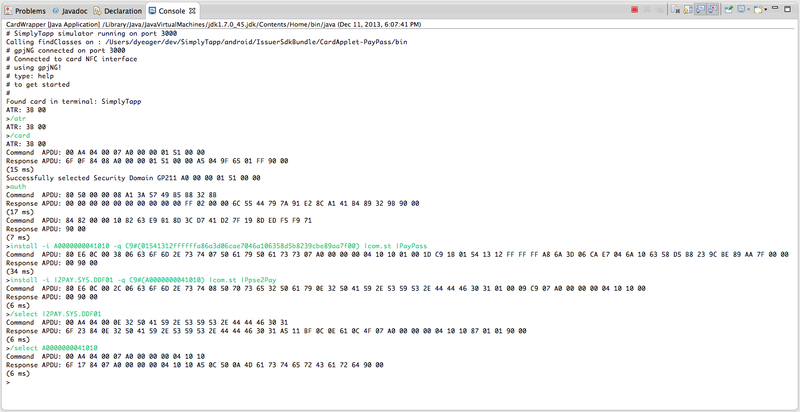 As you can see this script was run against a remote cloud card. 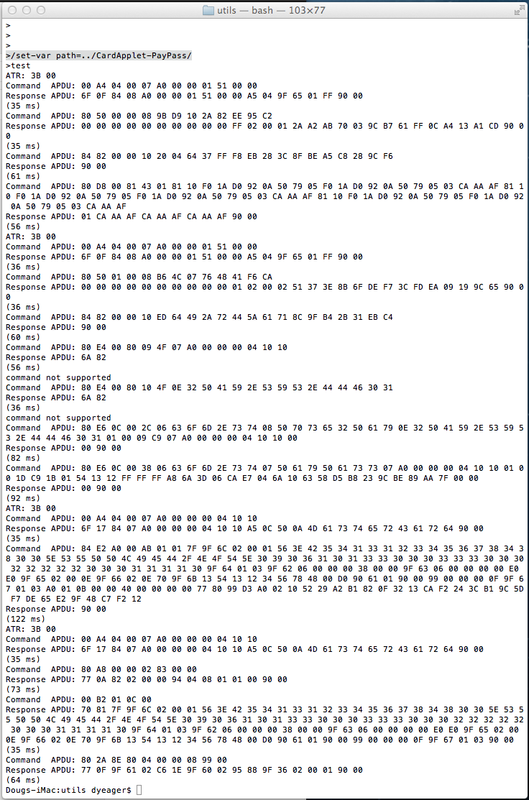 The APDU trace is a standard APDU trace for a typical paypass credential and the timings for each are displayed under the execution of each command. Just FYI, our office location for this test is Austin, Texas (where the script was run), but the cloud card is actually located in Dallas, Texas. Latencies probably reflect as such for each command. 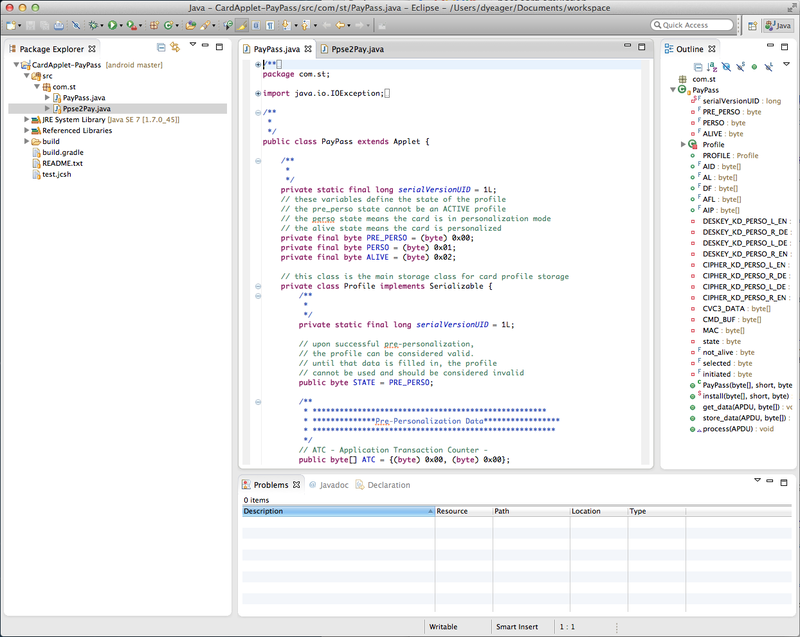 Stay tuned for future blogs that would demonstrate how to leverage this remote card inside an HCE android application. So please reply back with the response. Such an elaborately detailed article this is! I mean you have made sure that even a novice can take advantage from your post. Well done!